On the sad occasion of Dana’s death, here’s the column I wrote right after her husband died in 2004: Where’s Their Sense of Decency? 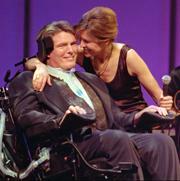 I learned that, just a day after the actor’s passing, one or more Republican senators put a surprise hold on the Christopher Reeve Paralysis Act. The uncontroversial legislation had been expected to sail through committee, and then the Senate, as easily as the House where it passed 418 to zero. This was beyond cruel; it was like opposing Mom and apple pie. And Congressional sources confirmed to me that the hold on the legislation was placed from the Republican side of the aisle.